vikingship.se & vikingship.net by Ove Långe Viking ship site. >> This is probably the most complete index site on the Internet. There is now over 150 finds and 300 ships in the index. Navigation >> Finally! The article about navigation and drawing maps during the Viking age. Help me add ships and info to the index. Most complete index site on the Internet. There is now over 150 finds and 300 ships in the index. The Gokstad ship >> An article about the famous Vikingship which so many modern replicas are built after. 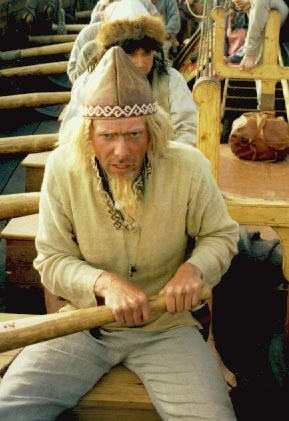 Rowing >> How to row a Vikingship. Sailing >> How to sail a Vikingship. >> Construction of a Viking square sail. The Viking Rigging >> Construction of the rigging of Vikingships. Erudition's >> Erudition´s from the past years. How to do and how not to do. Also anecdotes from my journey´s and meeting´s. Sea weather from SMHI >> Sea weather in Sweden the coming day. with the other Ships >> I will tell you about my meeting´s with other ships. Stories, anecdotes and about the good fellowship between us. Links to my friends websites >> Links to my Viking friends and there ships. >> The Gokstad replica Gaia, from Sandefjord Norway. They have sailed over the Atlantic to USA and Brazil.